Krokhino. Church of the Nativity of Christ, southeast view from Sheksna River. July 14, 2007. 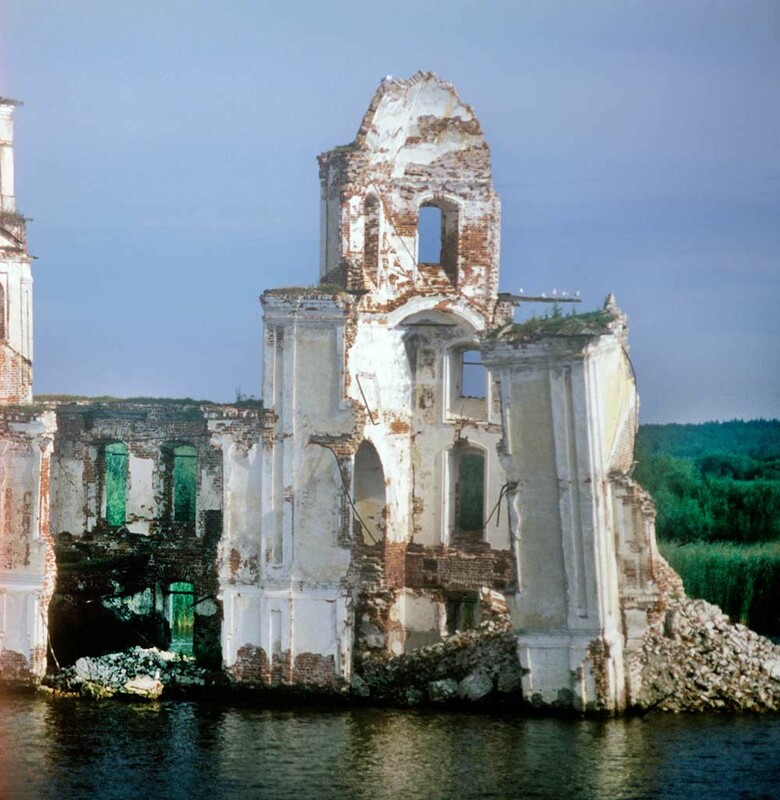 Little remains of the church, which was sacrificed to the Sheksna Reservoir. 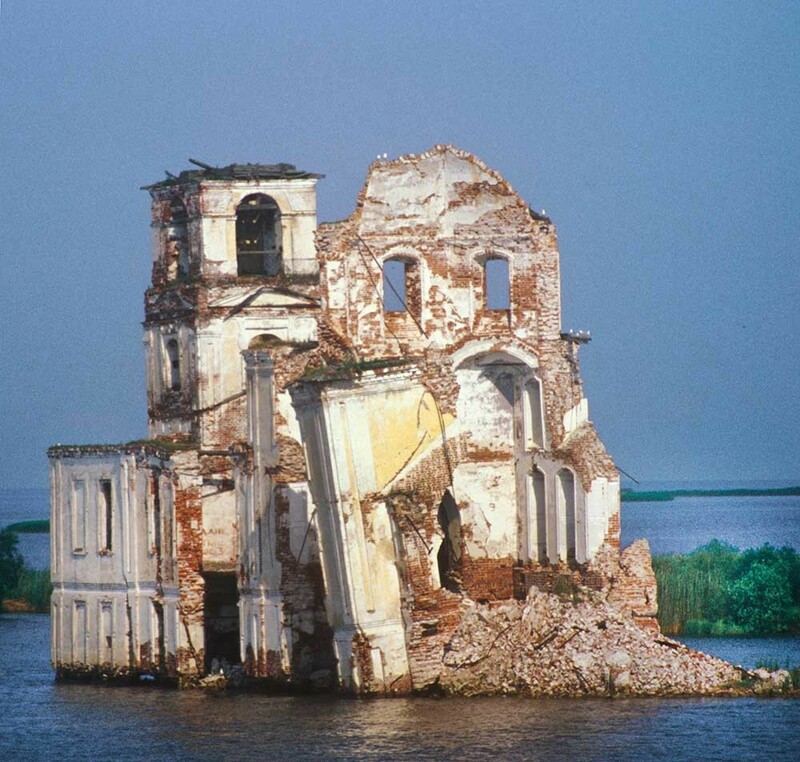 Each year thousands of tourists on cruises between Moscow and St. Petersburg pass by one of the most dramatically visible architectural landmarks in Russia — the semi-submerged Church of the Nativity at the former village of Krokhino. 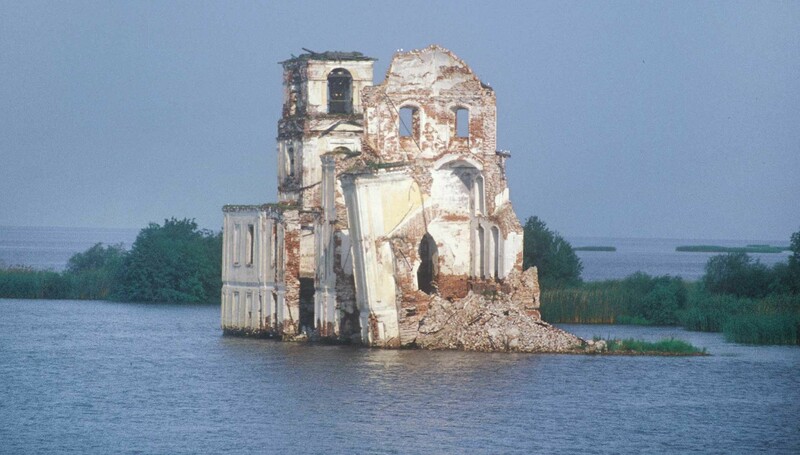 Although originally on the high left bank of the Sheksna River near the town of Kirillov, the Nativity Church was engulfed by the waters of the Sheksna Reservoir, created after World War II by damming the river for a hydroelectric project. Krokhino. Church of the Nativity of Christ, northeast view. Summer 1909. At the beginning of the 20th century, Prokudin-Gorsky developed a complex process for color photography. Inspired to use this new method to record the diversity of the Russian Empire, he undertook numerous journeys over a period of 13 years, often with the support of the Ministry of Transportation. His vision of photography as a form of enlightenment was demonstrated in public screenings of his color images taken in far-flung towns and villages. In 1909, he traveled along the Mariinsky Canal System linking St. Petersburg with the Volga River basin. This system is now known as the Volga-Baltic Waterway. Among the major components of that waterway is Beloe ozero (White Lake) in the Vologda Region. At its southeastern part, the lake is drained by the Sheksna River, a tributary of the Volga. Krokhino was situated near the point where the White Lake channeled into the Sheksna. Krokhino. Church of the Nativity of Christ, east view from Sheksna River. August 8, 1991. The earliest mention of Krokhino dates to 1426 in records from the nearby St. Kirill-Belozersky Monastery. Archeological evidence seems to link the village to the site of the ancient settlement of Beloozero before its move westward to the site of today’s Belozersk. For decades around the turn of the 19th century, Krokhino prospered from river work along the Mariinsky System. The Nativity Church was apparently built in stages over an extended period from 1788 to 1820. The lower part had a main altar dedicated to the Nativity of Christ. This was unique, since in Russia, most Nativity churches are dedicated to the Nativity of the Virgin Mary. The lower level contained two additional altars — to Sts. Peter and Paul and to St. Nicholas —located in the refectory extension. The church’s upper part, built in the early 19th century and consecrated in 1820, contained an altar to the Resurrection of Christ. 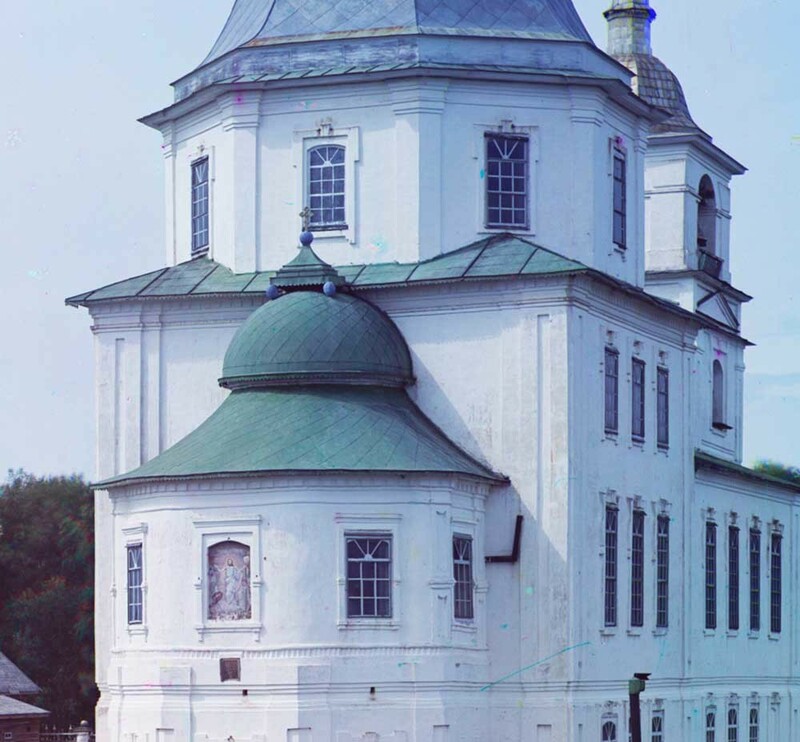 The Nativity Church reflects a simplified baroque style that lasted much longer in the provinces than in the major cities of St. Petersburg and Moscow, whose churches had adopted the neoclassical style in the 1760s, early in Catherine’s reign. 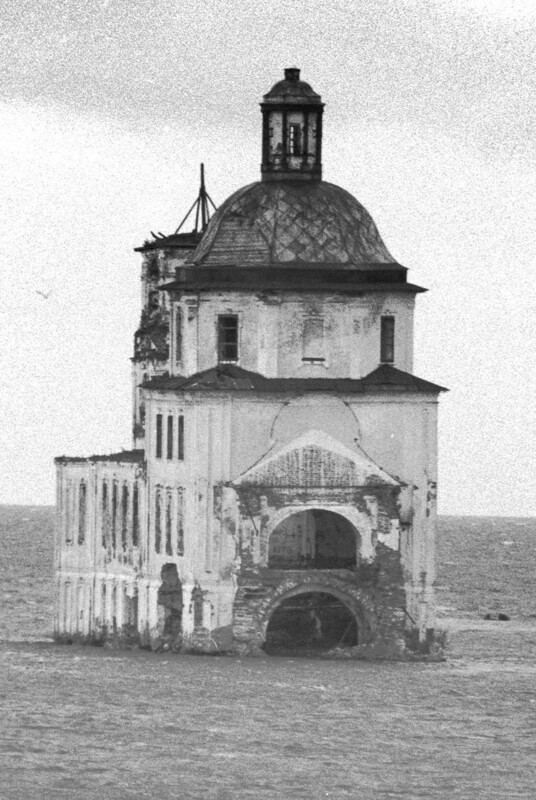 The Krokhino church followed the “ship” form, with a cuboid main structure, a lower refectory extending to the west and a bell tower (the prow of the “ship”) attached to the west end. The main structure was crowned with an octahedron supporting a bulbous roof, an octagonal lantern and a single dome. Interestingly, that lantern (an architectural term for a structure at the summit of a dome) probably saved the church from demolition. 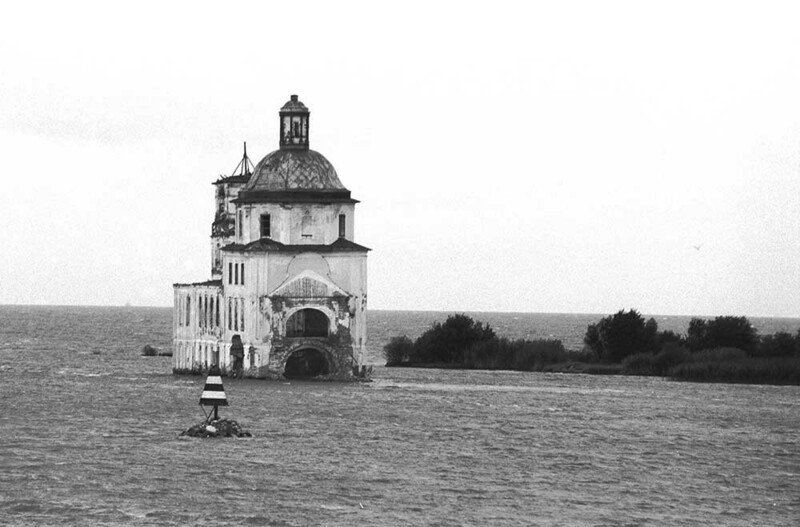 In 1953, local authorities decided to place a signal light on the church as a navigational guide, after planning for the Sheksna Reservoir had begun. Krokhino. Church of the Nativity of Christ, southwest view from Sheksna River. July 14, 2007. There are many interesting details in Prokudin-Gorsky’s rich photograph, taken from the northeast. In the foreground is a granite embankment and plank bridge over a small canal that led to the Sheksna (which is not visible to the left of the photograph). The three-part gate structure, crowned with three crosses slightly askew, contains traces of a mural of the Ascension in its central arch. The gate anchors an iron fence enclosing the church territory. Krokhino. Church of the Nativity of Christ, south view from Sheksna River. July 14, 2007. Prokudin-Gorsky’s view focuses on the polygonal apse (always in the east) that contained the primary altars for both lower and upper levels. The end of the apsidal structure is graced with framed frescoes on both levels. The lower painting displays the Nativity, while the upper depicts the Resurrection—corresponding to the respective altar dedications. Krokhino. Church of the Nativity of Christ, east view. Summer 1909. 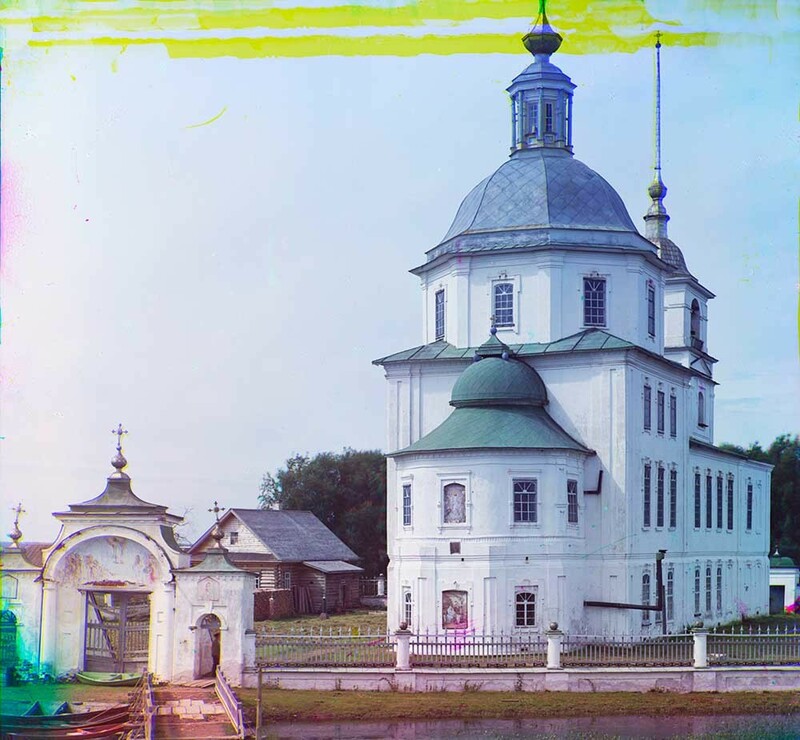 A revealing prosaic detail in Prokudin-Gorsky’s photograph is the exhaust pipe that extends from the right side of the apse on both the lower and upper level. Each pipe would have connected to a small wood-burning stove for heating the apse during the long, severe and damp winters. In fact, such two-storied churches usually held services only in the lower (more easily heated) part during the winter. My photographs on black-and-white film from August 1991 show the apse already collapsed, although its outlines are visible on the east wall. This view also clearly shows the interior division between lower and upper levels. The photographs taken 16 years later, in July 2007, dramatically reveal the collapse of the roof and dome, as well as most of the east half of the main structure, reduced to a mound of bricks. The southeast corner still stood in 2007, but with a perilous lean. It later collapsed. 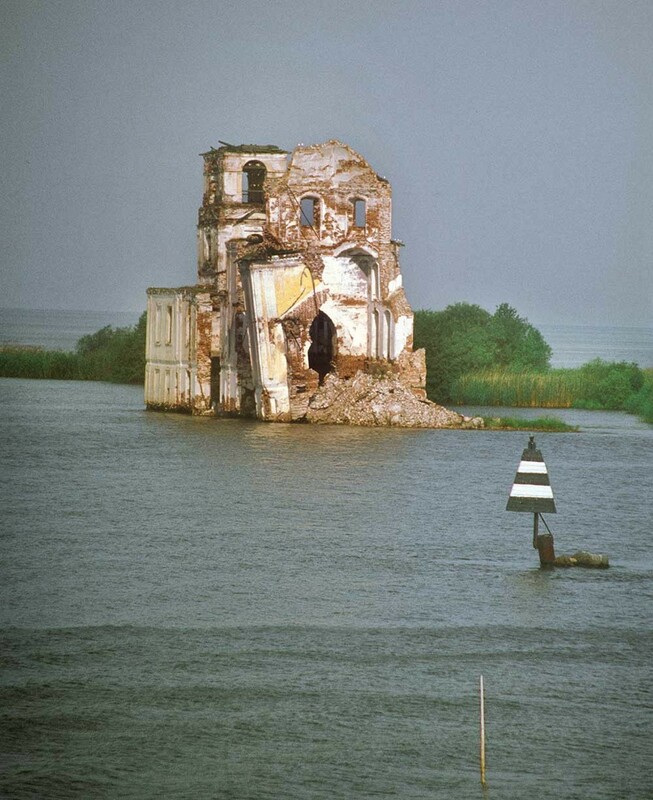 For the past several years, a public initiative has endeavored to preserve the remains of the church, including the creation of a small levee to protect the foundation. Nonetheless, finding the funds for structural restoration is a daunting task. 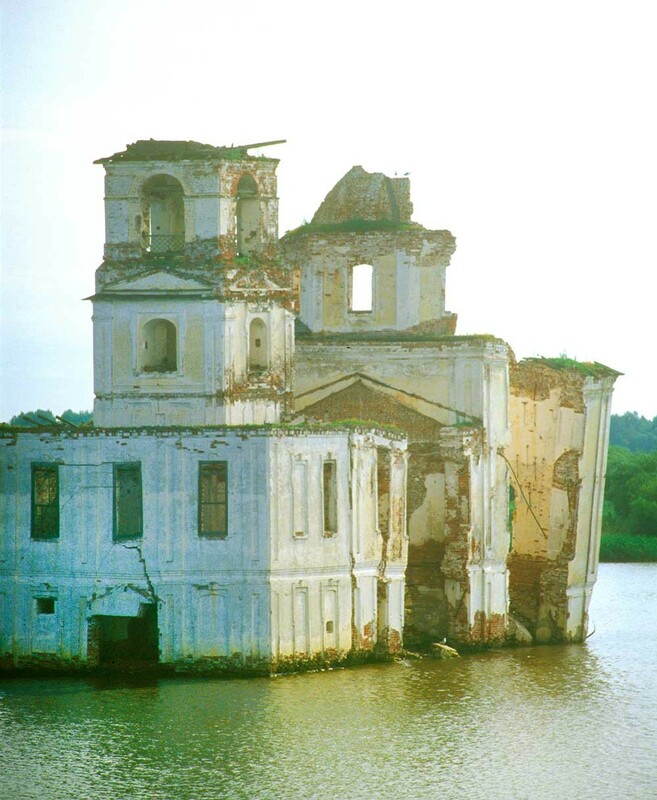 Prokudin-Gorsky’s photograph is all the more valuable as a record of a church that is gradually slipping into the waters.